Status: Rare casual spring visitor statewide. Accidental in fall. Documentation: Photograph: 12 Apr 1995 Lake McConaughy, Keith Co (Roberson and Carratello 1996; Gubanyi 1996). This species hybridizes extensively with Herring Gull; the hybrids, often referred to as “Cook Inlet Gull” after the primary location of hybridization (Williamson and Peyton 1963), often bear a close resemblance to Thayer’s Gull, but are generally bulkier. See Comments. 12-15 Apr 1995 first basic Lake McConaughy (cited above). The other reports are of a first basic bird at Sutherland Reservoir, Lincoln Co 3 Mar 2001 that was not accepted by NOURC due to poor photo quality (Brogie 2014), 2-4 Apr 2014, a juvenile at N.P. Dodge Park, Omaha (not accepted by NOURC due to possibility of the bird being a hybrid, Brogie 2015), 8 Mar 2015 Sherman Reservoir, Sherman Co, that was not accepted by NOURC (Brogie 2016), and 23 Apr 2016 an immature at Lake McConaughy (Silcock 2016, pending NOURC). Fall: The single report cited here is considered a fall record as it coincides with fall migration peaks of other large white-headed gulls and apparently did not winter. Comments: Two essentially identical first basic white-winged gulls which may have been introgressants of this species and Herring Gull were observed and photographed at Lake Ogallala 16 Feb 1996 (Silcock and Jorgensen 1997). 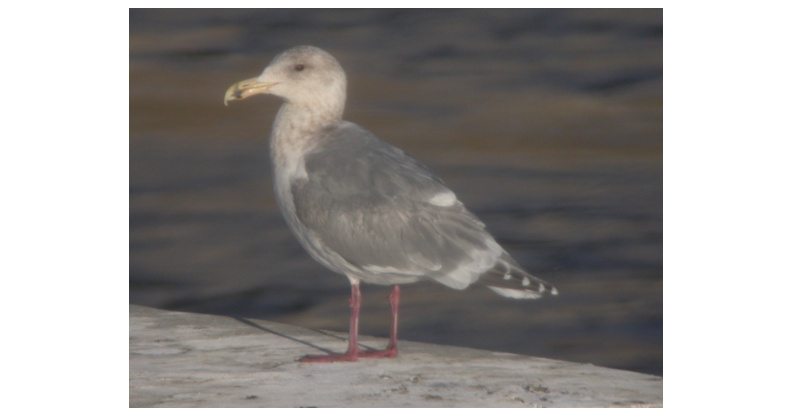 There is a Colorado record of Glaucous-winged X Herring Gull, 24 Jan 2013 (CBRC 2017). The records of this species from surrounding states are vastly skewed in favor of Colorado. Of a total of about 37 records, 29 are from Colorado (CBRC 2017) and two from Wyoming (Faulkner 2010), emphasizing the preference of the species for westerly Great Plains reservoirs. There are only four records in all for Kansas (Thompson et al 2011), Missouri (MBRC 2017), and Iowa (Iowa Ornithologists’ Union 2017). All but six of the records are in the period 11 Dec-1 May, and about 65% are Jan-Mar. Photograph (top) of a Glaucous-winged Gull at Lake Ogallala, Keith Co 16 Feb 2013 by Carlos Grande. CBRC [Colorado Bird Records Committee]. 2017. Glaucous-winged Gull records. Colorado Bird Records Committee database, accessed November 2017. Iowa Ornithologists’ Union. 2017. Glaucous-winged Gull records. Iowa Records Committee reports of Iowa rare bird records, accessed 21 February 2018. Jorgensen, J.G. 2002. 2002 (sic; =2000) (12th) Report of the NOU Records Committee. NBR 70: 84-90. MBRC [Missouri Bird Records Committee]. 2017. Glaucous-winged Gull records. Missouri Bird Records Committee database, accessed November 2017. Roberson, D., and R. Carratello. 1996. First record of Glaucous-winged Gull for Nebraska. NBR 64: 3-4. Silcock, W.R., and J.G. Jorgensen. 1997. Winter Field Report, December 1996-February 1997. NBR 65: 17-27. Williamson, F.S.L., and L J. Peyton. 1963. Interbreeding of Glaucous-winged and Herring gulls in the Cook Inlet region, Alaska. Condor 65: 24-28.